Once again we have seen Europe, in this case London, hit by an attack which tragically left several dead and others severely injured. Whether it was the work of an organised terrorist cell or the action of a person operating alone may make some difference from a political point of view. For the victims and their relatives, of course, that will be of far lesser importance. We mourn the loss of life and hope that all those caught up in the attack get the necessary help, both medical and personal, to help them overcome this tragic event. Now it is a reality: the United Kingdom is leaving the European Union. As I was personally saddened by Brexit, I still held out some hope that some way could be found to avert this outcome. However, now it is a fact. As the UK is part of Europe and the Channel should not be seen as a natural border which cannot be bridged, it is necessary to now face up to reality while at the same time developing future modes of cooperation that will allow for the continuing peaceful development of Europe. Across our continent, politicians and citizens alike must now look for positive ways forward without seeking to blame, take offence or indulge in any exclusive pursuit of self-interest. 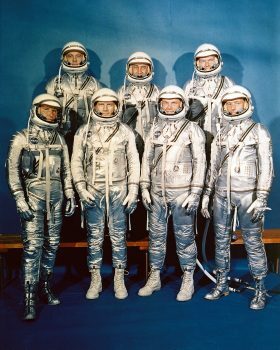 The seven (male) Mercury astronauts (from left) Wally Schirra, Alan Shepard, Deke Slayton, Gus Grissom, John Glenn, Gordon Cooper and Scott Carpenter. Coming back more directly to space, life can be full of surprises. Back in 2006 I had to explain to a search committee why I was well suited to be chairman of the German Aerospace Center, DLR. At that time DLR was active in the areas of space, aeronautics, energy and transport research. I was just a civil engineer. What arguments could I put forward? My first idea was to say that nobody can be an expert in all fields, so it is OK to take a layman. It was clear that this would be too disruptive. So I began looking for different arguments. It was easy with respect to energy and transport, as I had dealt with both of them in my studies and in my professional life. On aeronautics, I used the example of calculating the impact of a plane on power plants (which requires that you know about the structure of planes) and the design of a teststand for aircraft engines that takes into account sound waves. But space? Should I speak to them about the rockets I had built as a child? I decided to take a risk and be a bit provocative: I told the panel that perhaps I knew more about space than them. Overcoming their initial irritation, they allowed me to explain. During the process of finding astronauts for NASA’s Mercury mission, 7 “brave male” candidates were selected and presented to the public. However, in parallel, a selection process was also run for female astronauts. 13 were selected as candidates, no one paid any attention to them and none of them ever flew. As the search committee was not at all familiar with this story, they appeared convinced enough by what I had said. 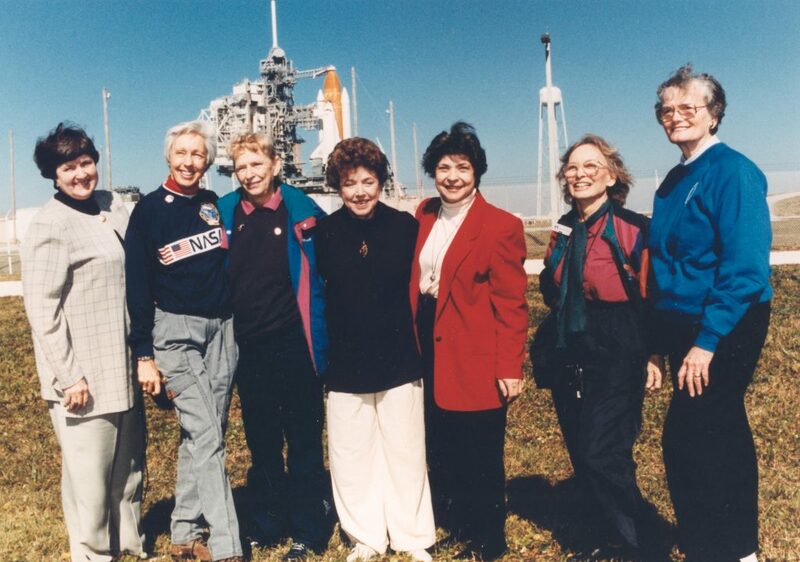 Seven Members of “The Mercury 13” can be seen in this photograph from 1995, from left: Gene Nora Jessen, Wally Funk, Jerrie Cobb, Jerri Truhill, Sarah Rutley, Myrtle Cagle and Bernice Steadman. Image credit: NASA. 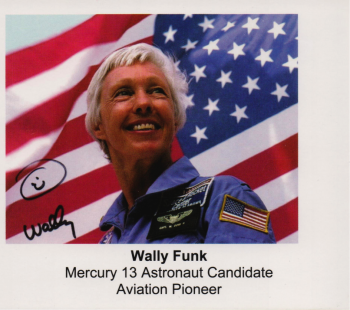 Wally Funk autograph card, courtesy: herself. Then, just the other day, on 30 March, I was interviewed by the BBC. It was announced that two ladies would be talking with me in my office. Imagine my surprise when one of them turned out to be one of the thirteen female candidates, Wally Funk! It was an inspiring meeting in which we went on to discuss the “Moon Village”, and the very promising developments taking place with it, with many entities having announced their participation and the founding of a “Moon Village Association”. How strange though, and what a wonderful surprise, to have had the privilege of meeting and speaking with one of these ladies who, obviously without knowing it, may just have helped me start out on the road that led me to my current job at ESA. 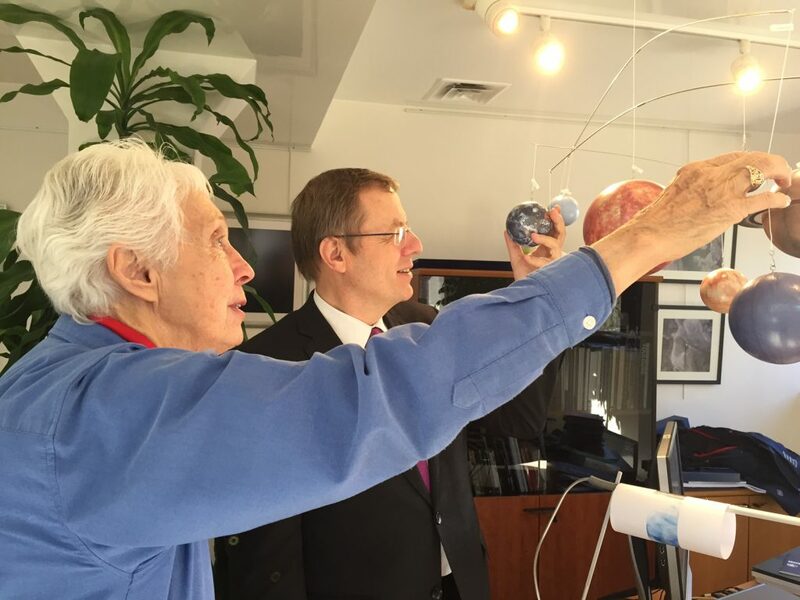 Mercury 13 member Wally Funk and ESA Director General Jan Woerner. Image credit: Sue Nelson. 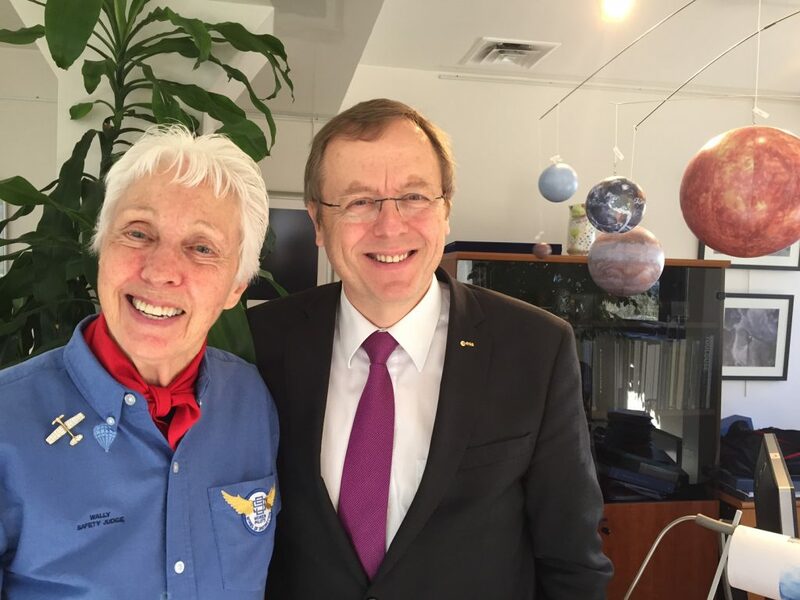 About Mercury 13, if not yet done, I recommend to watch the movie “No gravity” by our CNES colleague Silvia Casalino.